For many years I would see pictures of post-war (or pre-war for that matter) Vietnam and think what beautiful country that must be. A very small country, Vietnam is located on the eastern coast of mainland Southeast Asia. Because it is located in the belt between the Tropic of Cancer and the equator, there are only slight variations in seasonal weather and temperature, most of which is marked by variations in rainfall. I have always wanted to visit Vietnam and my opportunity came as part of the After-Do of the Singapore Do which is held yearly in Singapore. For this trip our little group decided to visit Da Nang which is located more in the southern part of Vietnam on the South China Sea coast. 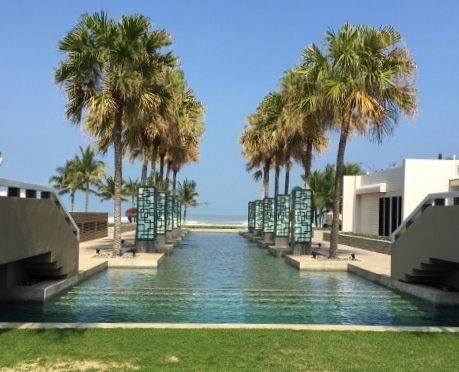 We had chosen to stay at the Hyatt Regency Resort and Spa – Da Nang. I arrived around 4pm on a rainy afternoon with the hopes that this was not to be the state of the weather during our entire stay. Luckily, it was not, for the sun shone brightly for the remaining three days. 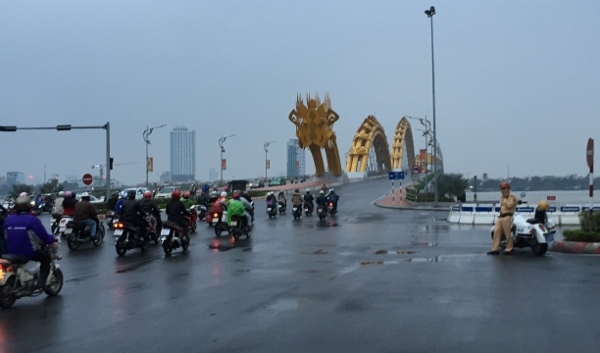 Da Nang is Vietnam’s fifth largest city and is certainly in a state of flux. My first impressions from my taxi ride included “Wow” there sure are a lot of mopeds; a slight state of awe at some of the architectural design which has gone into the city’s high rises; and surprise at the seeming shabbiness of many of the street level businesses. 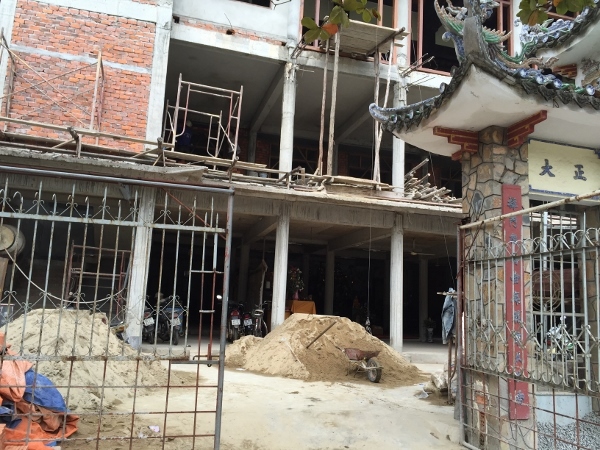 There are numerous sprawling, multi-million dollar resorts being constructed south of Da Nang as well as award winning golf courses. It is definitely a mix of old and new. The Han River runs right through the center of town and empties into the South China Sea. There are two bridges which span the river, one being the relatively newly constructed Rong Cao (Dragon Bridge). Begun in 2009, the bridge was opened to traffic in 2013. Everytime I crossed the Dragon Bridge or rode by it, I tried to get a decent picture, but usually the taxi was moving too fast. Although I did see it lit up at night, because I wasn’t there on a Saturday, I was unable to see the Dragon breathing ‘fire’ but I can imagine it is quite a sight! 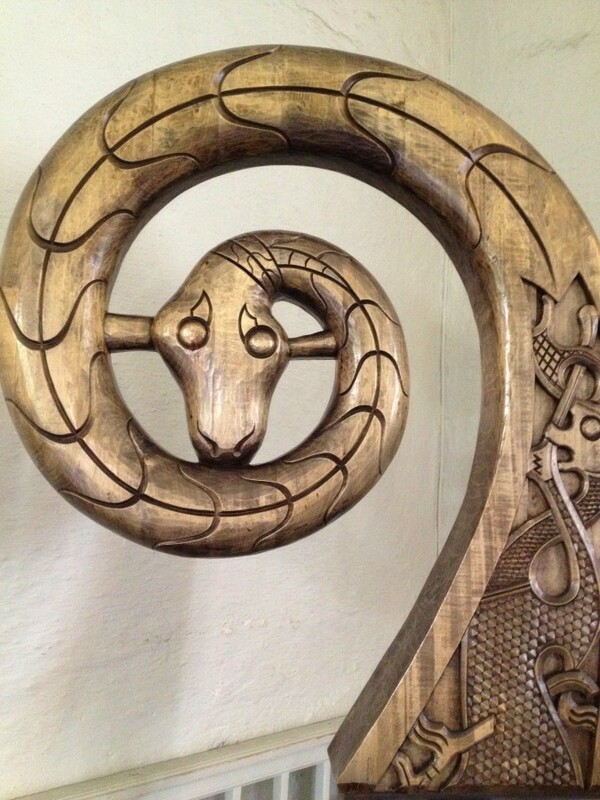 I can say this – it is an absolutely stunning piece of art, form, and function. 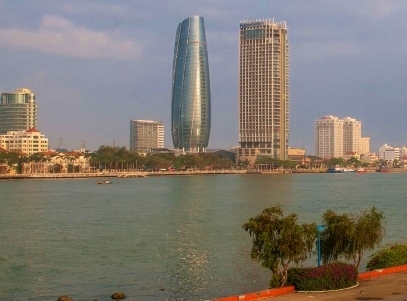 As the dragon is one of the most important symbols in Vietnamese culture, symbolizing power, nobility and good fortune, the city of Da Nang believes it will help increase the number of visiors to the area. 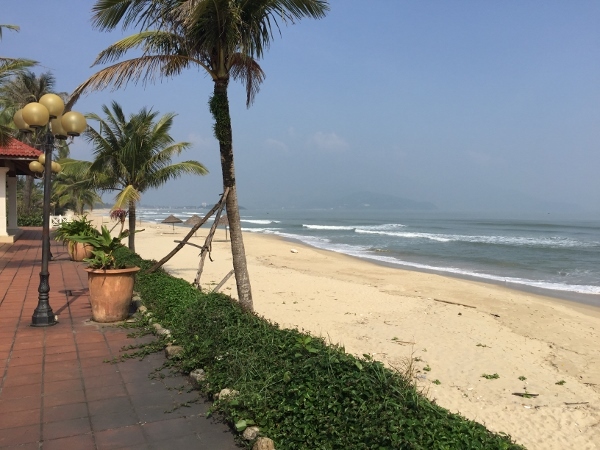 One of the biggest draws for foreign tourists to the area are the pristine beaches which edge the city of Da Nang and continue south towards Nah Trang, another seaside resort area. Da Nang is the perfect central spot for visiting some of the other attractions in the area. Our group took a day trip tour to the Imperial city of Hue. 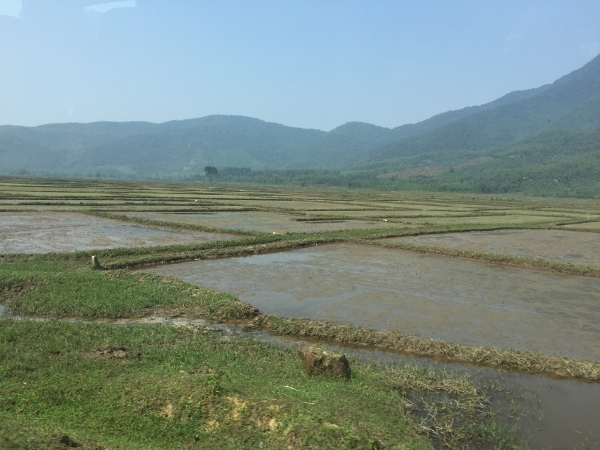 While very interesting, there was a lot of time spent in the van as the roads north of Da Nang consist mostly of two lane highways undergoing a lot of road construction. 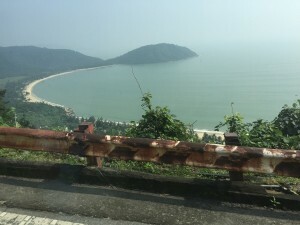 On the way we passed My Khe Beach, or China Beach as it was known to the American GI’s who first visited this area for R&R during the Vietnam war. Walking Food Tour – As a group, we took Shaun’s Da Nang Food Tour. We were quite pleased with the experience (I will have a review about it) and found it quite worth the cost of $45 per person. Hoi An – Recognized as a UNESCO World Heritage site, Hoi An is located about 25 km south of Da Nang on the Thu Bon River. This picturesque Vietnamese town with its colorful, but crumbling, French architecture, is also easily accessible from Da Nang by taxi ($12 from the Hyatt). Hoi An was an important trading port from the 15th through the 19th centuries and is worth an entire day of your time, if not two. 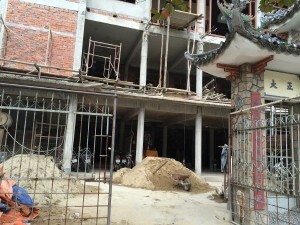 Hotels in Hoi An are all ‘local’ and incredibly affordable. Marble Mountains -The 5 peaks of the Marble Mountains are said to represent the 5 elements of water, wood, fire, gold and earth. Here you can explore 3 main grottoes which have been transformed into carved Buddhist sanctuaries. 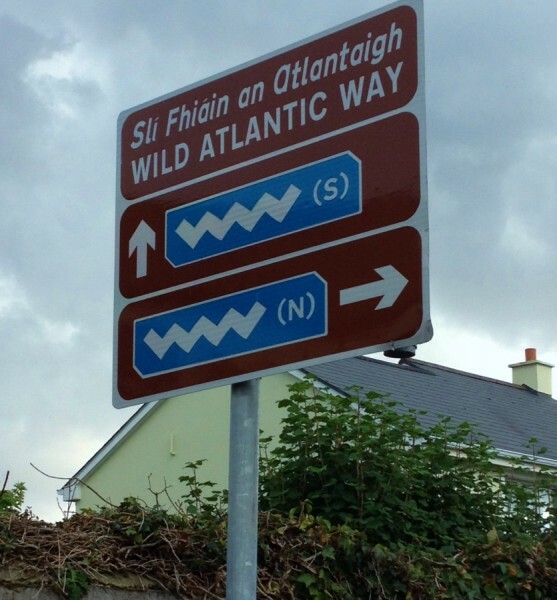 Be sure to wear walking shoes and take a flashlight for the caves. I would suggest having your hotel arrange hiring a private taxi to take you here. Da Nang is known for its stone sculpture and stone cutting crafts. Imperial City of Hue – Located about 2 and half to 3 hours north of Da Nang, Hue is definitely worth a visit. We did the trip in one day and it was a bit much. If you have the time, I would suggest an overnight stay in the Imperial City. Da Nang Museum of Cham Sculpture – The Champa Kingdom existed from the 2nd to the 17th centuries, and the Cham Nation still exists as a minority in Vietnam, with its distinct traditions. The Danang Cham Sculpture Museum is the place to see their works of art, well preserved, representing various Hindu gods and icons from the 7th to the 15th centuries. Dragon Bridge – Weekend shows of fire breathingtake place at 9 p.m.every Saturday and Sunday. The bridge is illuminated everynight with thousands of LED lights, with an ever changing color spectrum, creating a dazzling effect on the surface of the river. 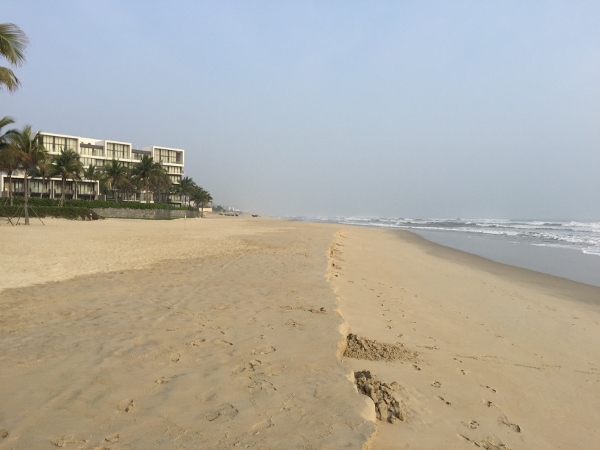 There are many other things to do in Da Nang – walk the promenade along the beach, visit the water park, ride the huge ferris wheel,visit temples – but I tried to touch on the ones with which I had direct experience in my limited time there. I do know one thing…. I definitely want to return. By far the easiest way to get around in Da Nang is by taxi. The rates are incredibly cheap. I believe it only cost me the equivalent of $12 to get from the airport to the Hyatt Regency – about a 25 minute drive. Fares start around 10,000 dong ($.50) and most taxis are metered. Make sure your taxi driver starts the meter. Any hotel will be more than happy to arrange a taxi for you and help you to establish a price before you set off. Make sure too that you are carrying small notes of currency as most drivers will be reluctant to change 200 or 500,000 dong notes. Mai Linh Tai can be called in advance at 0511 352 5252 or Vinasun taxi may be reached 0511 368 6868. I purchased my SIM for Vietnam at the Post Office window in the Domestic Terminal in Ho Chi Minh City. The cost of the SIM was 120,000 Dong (about $6.00). It was good for unlimited 3G data and minimal cost for texts and calls. The one I purchased was a Mobifone but I don’t think it really matters. The guy at the Post Office was more than happy to actually trim the SIM to a mini, insert it and set it up for me (which is good, because I wouldn’t have had a clue!). Your SIM will also come with an expiration so choose wisely. For instance, the 120,000 VND card may expire in 7 days and the 240,000 VND card may expire in 30 days. If you plan on being in Vietnam for a couple of weeks,be sure to choose an option that spans the entire time you will be there (although it is possible to ‘Top Up’ your SIM). 2 Comments on "Da Nang, Vietnam"
I will be writing about our day trip to Hoi An. My only regret is that I just didn’t have enough time to see all I wanted. A return trip is definitely in order!